I think we would all agree that when it comes to dressing up, accessories are usually the key for a perfect, final look. They can spice up even the most simple outfit and bring it to the whole new and much more fashionable level and I'm pretty sure my today's look is a perfect example of that. 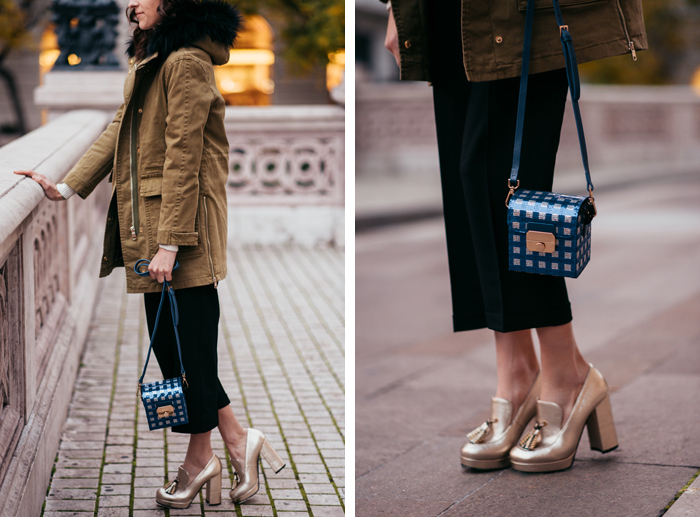 Green parka and a classic black culottes, I don't think it gets more basic than that, but add a pair of sparkling gold shoes and a cute bag and voila! Have a lovely beginning of the week everyone! Oh my!!! Your shoes and bag are majestic pieces which have turned a simple daytime outfit into a show stopping one!